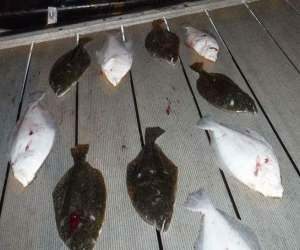 Trip Rates | FLOUNDER GIGGING! ROCKPORT, PORT ARANSAS, CORPUS CHRISTI, TX! (Read “How to Reserve” and “Cancellation Policy” Below. PEOPLE OF ALL AGES AND SKILL LEVELS ARE WELCOME! Capt. James works hard for every customer and takes great pride in all that he does. Expect nothing less than the “perfect experience”! 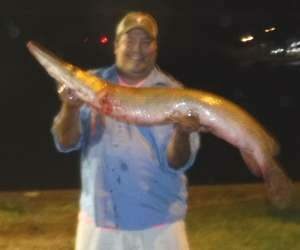 He began fishing as a boy and that passion continues to the present. Sometimes the weather can make trips more challenging, but a professional guide can always find the fish – and Capt. James is no exception. He learned a good and honest work ethic from his dad an uncle – who both taught him to the love of fishing when he was a boy…and that passion remains to this day! He gladly shares all of his expertise with everyone who wants to learn how to gig flounder and he’s very, very good at what he does!! He is also First Aid Certified and has a well-stocked First Aid Kit on board for every trip. So, when “others might throw in the towel”, Capt. James is a FLOUNDER SPECIALIST!!! NOTE: Safety is Priority One when you fish with Capt. James. He is First Aid Certified and has a well-stocked First Aid Kit on board for every trip. GPS Technology and a fully-charged cell phone are also on board at all times. You will have access to many bays: Corpus Christi Bay, Copano Bay, Aransas Bay, Baffin Bay, Mesquite Bay, Port Bay, St. Charles Bay, San Antonio Bay, Redfish Bay, Mission Bay, San Carlos Bay and Alazan Bay. Needless to say Capt. 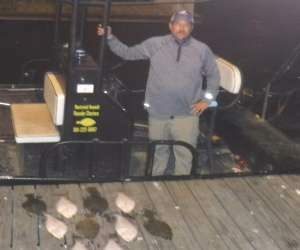 James knows the Coastal Bend waterways better than most and this allows for more options when looking for flounder… plus, there’s sure to be a bay near you – whether you stay in Corpus Christi or north of Rockport near Port Lavaca. You’ll board close to sunset and the captain will fill-you-in on the location and time for departure prior to the trip date. Capt. James is a natural teacher (not everyone has the patience, good nature and skills that are essential to being a top-notch fishing captain)….you’ll learn from a pro and in no-time will be gigging flounder and getting them in the boat, like you’ve been doing it for years! Seriously – once you know what to do and with the help of Capt. James’ guidance, you’ll be singing his praises too! It’s great fun with a great captain! Note: we might upon ocassion gig Black Drum, Sheepshead and Gar – but the primary focus is to gig one of the best tasting fish in the world – Flounder!!! Secondly, flounder are caught year-round. Flounder gigging is closed for the month of November during which time we gig Sheepshead and Black Drum – also delicious and fun to gig fish! Then during the 1st 2 weeks of each December, it’s a limit of 2 flounder per person – it’s their migration run, and that’s when the flounder are at their largest and they are heading-out to deeper water for the winter months. In early spring (March), they come back into the bays and the flounder fishing continues to be great for the rest of the year. ONLY HIRE A USCG LICENSED CAPTAIN TO BE IN THE BEST OF HANDS. When you step aboard his boat, you’re going to impressed and feel at ease because he is so well-versed on cruising the bays for flounder! Relax and Have Fun – Leave the Rest to Me…..that is his Motto! The captain provides everything you need for a successful night on the water gigging flounder. For younger kiddos, you might want to bring a more snug fitting life vest (US Coast Guard approved please). but otherwise there’s an iced-down chest for your cold drinks and snacks! (There is no bait involved because we are gigging flounder!) Your fish are cleaned and bagged for the trip home, so bring an empty ice chest in your car to transport your “fresh catch”! Trips are more comfortable when you bring a light jacket (weather condition will vary throughout the year). Other items to bring may include: insect repellent (strongly suggested), your favorite drinks and snacks, camera and binoculars (other marine life may be observed), and an empty ice chest so that you can transport your “fresh fish” back home with you! ***Alcoholic Beverages and Beer are Allowed, but the Captain Asks that You Drink Responsibly Please. NOTE: YOU MUST HAVE A TEXAS STATE FISHING LICENSE WITH SPECIAL SALTWATER STAMP IN ORDER TO FISH FROM THIS BOAT. You can purchase your license at any sporting goods retailer (like Academy, Dicks, Bass Pro Shops or Walmart, HEB and local tackle shops in Rockport, Texas. FOR MORE INFORMATION CLICK THE GREEN TPWD LOGO! THE BEST AND QUICKEST WAY TO RESERVE IS TO CALL CAPT. JAMES: 361-222-6007 He is frequently on the water, but will return your call as soon as he gets back to shore!! A $100 Deposit is Required to hold our trip date and are non-refundable. The Captain reserves the right to cancel a trip due to inclement weather, mechanical issues, or any kind of unforeseen events that would put his customers at risk or in harm’s way. Trips lost due to captain’s cancellation or customer’s cancellation may be rescheduled with a 14 day notice by phone call. PLEASE ARRIVE ON TIME – THE CAPTAIN WILL TEL YOU WHERE TO MEET AND ALL THE DETAILS BEFORE YOUR TRIP. GUESTS ARRIVING MORE THAN 15 MINTUES LATE WILL BE CONSIDERED A “NO SHOW”. CLICK TO CHECK-OUT MY NEW PHOTOS ON FACEBOOK!